Local people who care about and get involved in the community. 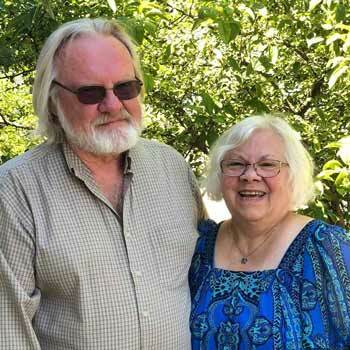 That's Roy and Linda Holden, owners of Holden's Home Emporium on Main Street in Scottville. They started over 22 years ago selling furniture in a small pole barn, and their business has prospered thanks to loyal customers who know a good deal when they see it. The Holden's motto is, "We sell our reputation...our products come with it!" They truly do stand behind everything they sell, from bedding and couches to recliners and tables. The Holden's now have six buildings with over 55,000 square feet of furniture! 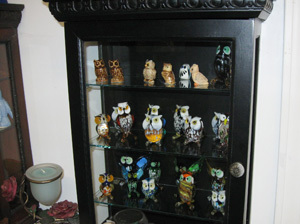 All four showrooms carry a blend of new and used furniture, accessories, bedding...even antiques and vintage pieces. Roy and Linda don't believe in high mark-ups, so their furniture and home decor prices can't be beat. A Furniture Store and More! 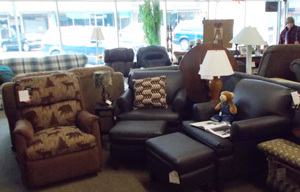 You may be surprised when you walk into their showroom and see the nice variety of couches and recliners on display. And you will be shocked when you see the low prices! The Holdens want you to have nice, comfortable furniture for your home without going into debt. Make sure you spend some time browsing. Often you're looking for something and you won't 'know it until you see it.' Possibly tucked away in a corner you'll find that perfect little table you've been searching for, or just the right size bookcase. Shopping at Holden's is an adventure! Be sure to ask about their no-fee layaway plan. Quality bedding doesn't have to cost a fortune. Holden's believes that if you buy a mattress set for under $500, it only costs $.23 per night double occupancy. At this rate, you could buy a whole new set every three years and have a nice, new mattress to sleep on. They carry sizes from twin up to king, with 15 different styles to choose from. There's a mattress to fit your body--come on in and find the right one for you! You can't miss Holden's Home Emporium. 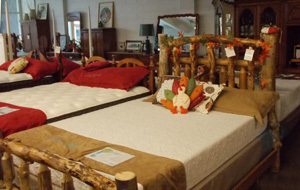 Their main showroom is located in downtown Scotttville at 119 S. Main Street. They are open for your convenience Mon-Fri 9am-5:30pm and Saturday 9am-4:30pm. Helping out our neighbors and our local economy...that's what happens when you shop locally. You'll keep more money in your pocket, and find the perfect furniture for your home, when you shop Holden's Home Emporium, downtown Scottville. From our Home to your Home!